If you’re looking for comfort food at it’s finest, Pioneer Woman recipes combine country-style deliciousness with ease for mouth-watering meals you’ll want to make again and again. Her simple and fantastic collection of recipes will make for feel-good meals you can enjoy with your family any day of the week! From vegetarian options, to hearty meat dishes, intoxicating desserts and snacks perfect for the mid-morning or afternoon slump, the Pioneer Woman knows how to make good food. Read on to see 50 of her amazing recipes, perfect for any occasion! Who is the Pioneer Woman? You may recognize the Pioneer Woman from her hit show on The Food Network. Personally, the first time I saw her show was on the TV at my gym. Her name is Ree Drummond and she’s a blogger, author, food writer, photographer and television personality, living in Oklahoma. She’s built an empire around her charming country life, which also now includes The Pioneer Woman Mercantile, a 25,000 square-foot restaurant/marketplace in Pawhuska, Oklahoma. She’s known and loved for her delicious, country-style meals and has come out with a number of cookbooks so you can whip up her meals from the comfort of your home! If you don’t know about the Pioneer Woman yet, you’re going to get to know her and her comfort country cooking style in this post! These cookbooks will take your meals from enjoyable to absolutely delectable. The recipes are not only delicious, they’re also simple to whip up so you don’t have to waste precious time standing over the stove on busy nights and at holiday gatherings. They’re sure to become some of your new favourites when you want a hearty, country-style meal! Perfect for those who live busy, on-the-go lives, the pioneer woman dishes in this cookbook are simple, scrumptious, and totally doable. The cookbook includes 120 recipes for breakfast, lunch, dinner and snacks, and they’re all recipes you can get on the table without a lot of stress! Wondering what’s for dinner? This cookbook includes easy-to-make recipes for comfort classics, 16-minute meals, freezer-friendly food, as well as soups, salads and of course, breakfast for dinner! With over 125 recipes, it’s a cookbook you can rely on any night of the week. If you’re looking for Pioneer Woman party food for your holiday gatherings, this is the cookbook for you! From Christmas rum cake to glazed ham, and of course an array of Pioneer Woman pie recipes, you’ll love this holiday cookbook! For the ultimate soul-satisfying comfort food recipes, you need this cookbook in your life. With recipes including restaurant-style salsa to glazed doughnuts and the best grilled cheese ever, you and your family won’t be able to get enough! The Pioneer Woman definitely knows how to make a statement at the table. Try these simple recipes to wow your family and guests! 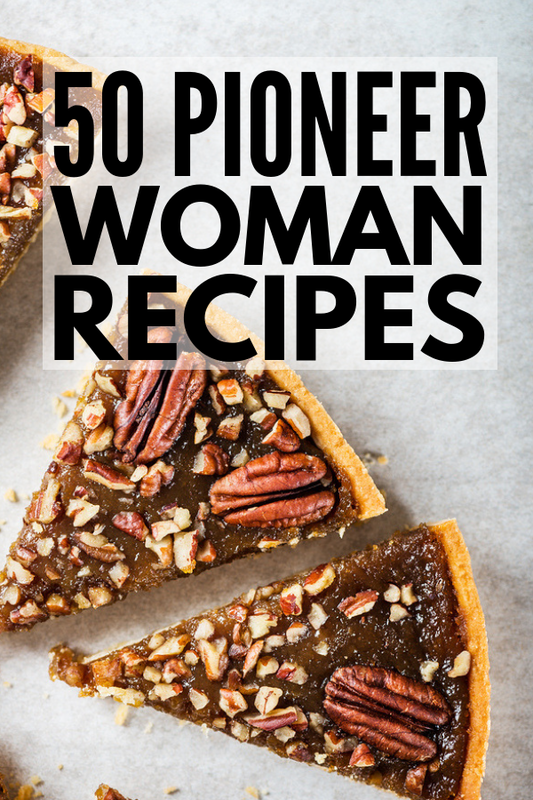 If you loved this collection of Pioneer Woman recipes, please share this post on Pinterest! And if you’re looking for more delicious recipes, please follow our Food board on Pinterest!